The mind likes novelty, which draws its attention. That’s how we learn. If you think “Been there, done that!”, you’ll pass the experience by, assuming it has nothing to give you that you don’t already have. Could some vision problems be fed by an attitude of boredom? If you don’t think there’s anything interesting to see, why look? Once I started vision improvement, I realized I’d been taking my eyes and eyesight for granted. I had been pushing my visual system to perform as if I was a machine, not a tender sensitive living being who needs appreciation and love. Would I ever treat a child, or even a pet, this way? As I started exploring what I could see without glasses, I felt a lot of gratitude for the view my eyes gave me, blurry or not. I also felt some guilt for how neglectful and unappreciative of them I’d been most of my life. Since I’d been myopic from a young age, I’d seen my vision as a problem, not a gift. I started to let my eyes “play” instead of working so hard, rewarding them for their faithful service by giving them bright colors and scenic views to explore. I could feel the joy in my whole body when I was looking at something beautiful, as I let its energy all the way in without the barrier of glasses between us. If you usually wear eyeglasses, why not stretch yourself by looking at something familiar without them? Take your time, examining the details you can see. You might surprise yourself by how free this feels. Please do not put yourself in danger, trying to drive or do something else where you can’t see well enough to be safe. And we often don’t need our glasses as much as we think we do. Something else to try to shake up your usual visual routine is to look at something you look at often, maybe something inside your house, and look for longer than you usually do. Maybe you’re accustomed to glancing past it, never really seeing it fully. Say it’s a picture or painting on the wall which has been there for years, “part of the furniture”. Let your gaze roam over it, the lines and shapes and texture and colors. How fully could you describe it, even though you may see it every day? 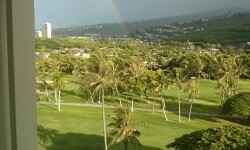 The photo was taken from my hotel room in Hawaii a little over a month ago, where I was participating in an energy medicine workshop. I decided to just keep looking at the scenery, as I was in no rush, and was rewarded with a rainbow. Did you see it right away? I am realizing how often I “look”, and still miss the obvious! If you give your eyes and brain new and interesting input regularly, they’ll stay vibrant and engaged in life. Life is ever-changing, especially outdoors in Nature, so there is always something new to delight your vision. Enjoy it, and be grateful. Previous Previous post: What Did You Make It Mean? Next Next post: Do Your Eyes Reflect Your Self-Care?